With the weather being so bad we decided to stay in the local area rather than risk getting caught up in any travel chaos and went for a walk along the Rivers Avon and Clyde. 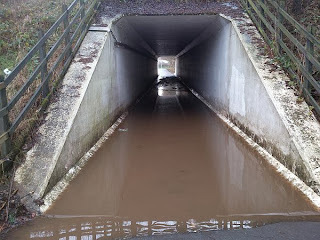 Normally this is a fairly pleasant walk or cycle, but today involved jumping over large puddles, climbing over high fences and running across a main dual carriageway. 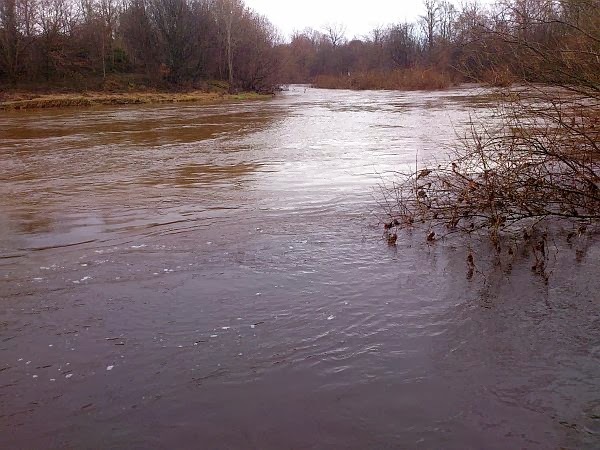 The reason for this was the flooding in the area. This was quite extensive with the water level reaching three feet in some places and required fishing waders to walk through. As neither of us possess fishing waders, it was easier to find an alternative route. 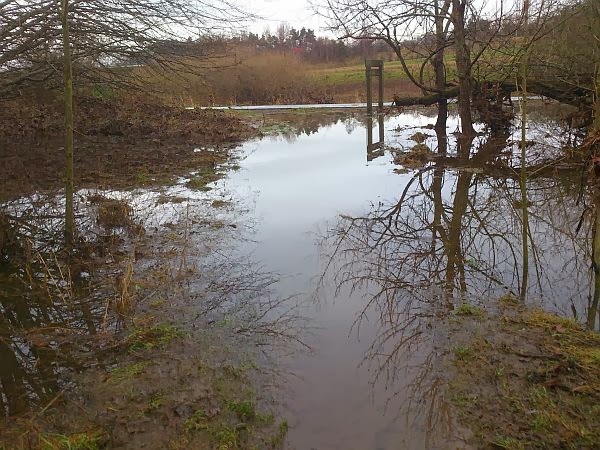 Flooding is quite common during the winter but usually you can wade through it wearing normal walking boots, but not at the moment! At one point in the walk, where the Rivers Clyde and Avon meet - the water level was very high and the path under the Clyde Bridge, joining the main towns of Motherwell and Hamilton, was flooded. Taking a short detour to the main Motherwell Road and crossing the dual carriageway seemed the best option so we had to run across to the central reservation, climb over the barrier and run to the other side. Fortunately, no police cars were in the area! 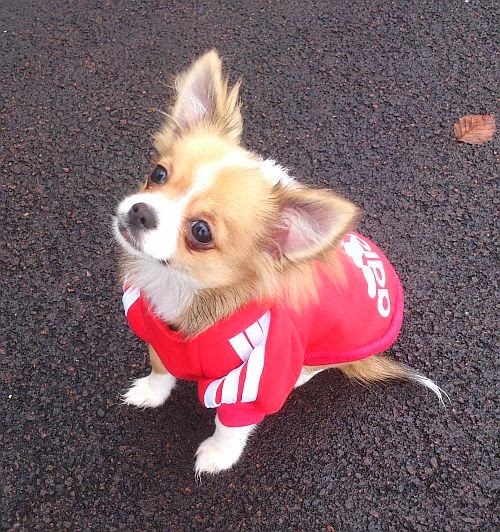 In Strathclyde Park we saw a small Long-haired Chihuahua wearing an Adidas hoodie! According to his owners, these are very fashionable and are known by the brand name, Adidog! I managed to get a photo of the wee fella modelling his red hoodie as shown above. What a wee cutie! The underpass between Motherwell and Hamilton is always flooded when there is a period of prolonged rain. 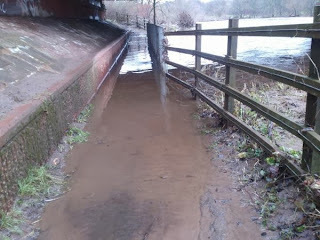 From the photo above it can be seen that the path is not level and this is the cause of water gathering on one side, as well as there being no drainage. The water was waist high so a dingy would have come in handy! With the Commonwealth games only a few months away, one wonders if the local council is going to fix this, as the path will be used by a large number of people. I suppose we will have to wait and see. The triathlon will be held in Strathclyde Park so we will go down to watch the action as it unfolds. 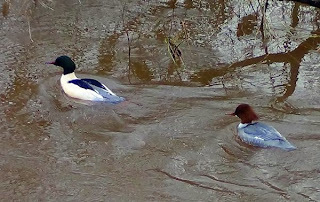 On the River Clyde, adjacent to the footbridge between Motherwell and Hamilton, we saw a pair of Goosander. 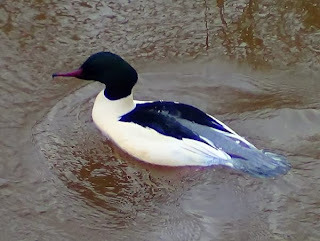 Goosander are usually shy birds and keep well away from areas where many people pass through. As the underpass above was flooded and the footbridge was the only access to it, the area was quiet and so the Goosander probably thought it was safe to swim in the area. Goosander are the largest of the sawbills. I took some photographs with my video camera as I can zoom in close, although the resulting photographs are never the best quality. The top photograph above shows a close-up of the male and the hooked end to his bill. This is used for catching fish as the bill has sharp serrations. The bottom photograph shows the male and female. The female has brown markings as opposed to the black of the male. It had been another eventful day.